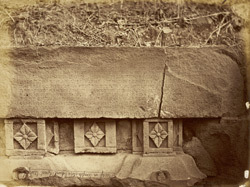 Photograph of the inscription slab in the ruined temple near the Mahadeva Temple, at Patan (Patna), Khandesh District, taken by Henry Cousens in the 1880s, from the Archaeological Survey of India Collections. This temple is mentioned by Henry Cousens in "Revised List of Antiquarian Remains in the Bombay Presidency", vol.VIII, 1987. It consists of a long hall with no cell shrine and was probably a matha or rest-house attached to the larger Mahadeva Temple. This view shows the much damaged inscriptoin above the entrance doorway.